On October 5th, the St. John Bosco Braves remained undefeated and beat Orange Lutheran 63-28 at Panish Family Stadium behind three special teams touchdowns. The Orange Lutheran Lancers came into this highly-anticipated Trinity League matchup against the Braves ranked 10th in the nation, and they played Bosco tough for the first two and a half quarters. Braves junior sensation DJ Uiagalelei showed out again, completing 22 of 27 passes for 264 yards and three touchdowns. Uiagalelei again played clean football, with no turnovers to his name. Five star quarterback Ryan Hilinski threw for 258 yards and three touchdowns, but the Braves kept him in check, forcing him into two interceptions on the night. The Lancers battled hard in the first half, tying the game at 21 right before halftime on a Hilinski touchdown strike to wide receiver JoJo Hawkins, one of his two touchdown catches on the night. However, junior receiver Tyus Poyer returned the ensuing kickoff all the way to the house with no time left on the clock before halftime, giving the Braves a 28-21 lead and all the momentum heading into the locker room. Junior Kris Hutson then followed up Poyer’s act by returning the opening second half kickoff for a touchdown as well, one of three Braves special teams touchdowns on the night. Huston also returned the opening kickoff for a score. Hilinski and the Lancers answered back with a scoring drive capped off by a Logan Loya touchdown, bringing the Braves lead back to 35-28. From there however, Bosco’s offense and defense clicked simultaneously, with back-to-back throws from Uiagalelei to Huston for touchdowns and a George Holani 40-yard touchdown run. The Braves finished the game with a 63-28 commanding victory. A great second half performance from both units gives Bosco some great confidence heading into this week’s matchup of the year against rival Mater Dei. Both teams are ranked at the top of the nation, with Bosco getting the majority of votes for the number one spot. The game will be the ultimate test for both teams, who are both in contention for a national championship at the end of the year. The game will be played at the Santa Ana Bowl on October 12th, and both schools expect limited seating, so get your tickets in advance. 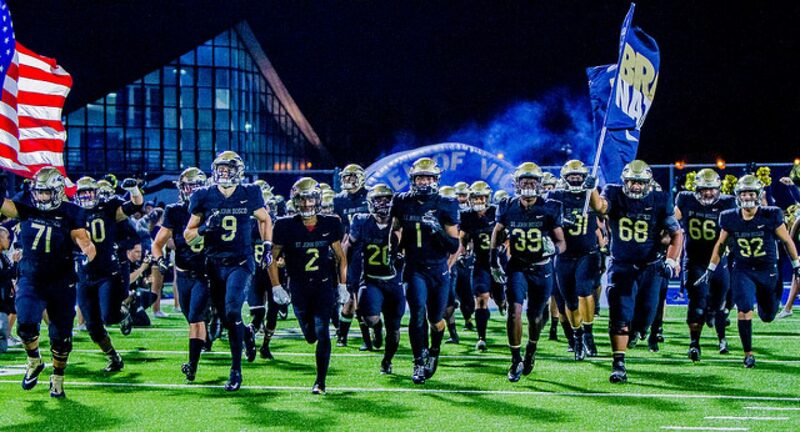 It’s Mater Dei week at Bosco, and it’s time for the Braves to assert their dominance as the number one team in the nation in high school football this year.